Does teaching how to write a Harmonic Chromatic Scale make you want to run away and hide? If you are at all like me, you like things to be either right or wrong. You like there to be one correct answer. For the most part, when writing scales, there is only one correct answer. In preparing for the Royal Conservatory of Music Exams, use the Ultimate Music Theory Intermediate Rudiments Practice Exams to reinforce the rules for writing a Chromatic Scale. The Chromatic Scale must start and end on the same Tonic note. Each letter name is used at least once. You cannot skip a letter name. A letter name may be used twice in a row, but never more than twice. Enter the Harmonic Chromatic Scale. Suddenly there is more than one correct answer. 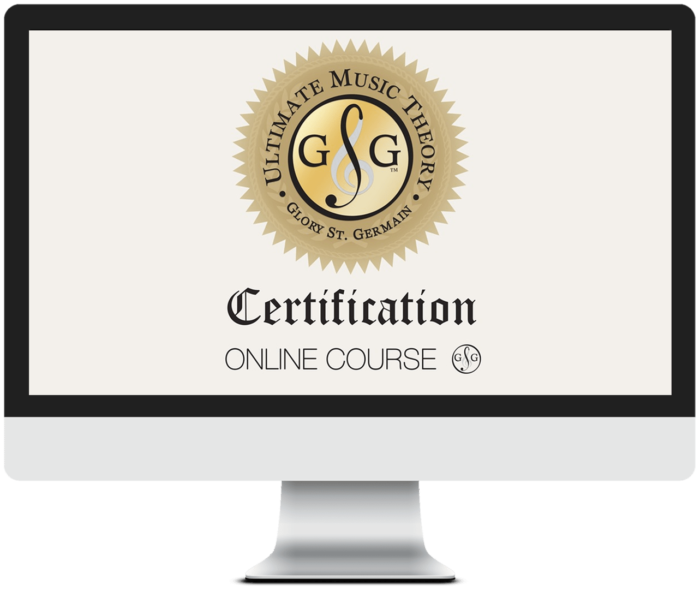 Learn the Ultimate Music Theory's 4 Super Steps on how to write a Harmonic Chromatic Scale perfectly, every time, guaranteed. A Chromatic Scale uses all 12 semitones in the octave, for a total of 13 notes. You can write a Harmonic Chromatic Scale. You can write a Melodic Chromatic Scale. You can write a Chromatic Scale using any standard notation. I love form in music. I love seeing a pattern and having a Memory Jogger for that pattern. For me, the easiest Chromatic Scale to write is the Harmonic Chromatic Scale. Why? A single Tonic, Dominant and Upper Tonic Note (based on the Major Key of the first note of the Harmonic Chromatic Scale) is used ascending. A single Dominant and Tonic Note is used descending. All other letter names are written twice. The Harmonic Chromatic Scale is the easiest of the Chromatic Scales to write simply because there is only one way to write a Harmonic Chromatic Scale. Let’s work through an example of writing a harmonic chromatic scale starting on E, using a Key Signature. Use your Ultimate Whiteboard or download the Free Resources Staff Worksheets. Follow the instructions for each step and then check your work. Step #1 – The Key Signature will always be the Major Key of the given note. So, the Key Signature will be 4 sharps – the Key Signature of E Major. Write that Key Signature. UMT Tip – A Harmonic Chromatic Scale can be written with or without a center bar line. UMT Tip – If you do not write your notes small enough and you run out of room on the staff, it is okay to draw lines to extend your staff as needed. Remember to put a double bar line at the end of the extended staff. Step #4 – Add accidentals to create the Harmonic Chromatic Scale pattern of semitones (half steps) between each note. Do not change the given I and V notes! UMT Tip – Draw a keyboard in the margin of your paper. Point to the keys on the keyboard as you add the accidentals to create the semitones. To write a Harmonic Chromatic Scale using accidentals (instead of a Key Signature), simply omit Step #1! You can’t write the Key Signature if you are using accidentals. So, grab that Whiteboard or Staff Paper and write the Harmonic Chromatic Scale starting on E using accidentals. Writing a Chromatic Scale using any notation (Harmonic Chromatic, Melodic Chromatic, etc.) is a required concept for Intermediate Rudiments. Check out our Intermediate Rudiments Workbook on Pages 48 and 49 to learn more about Chromatic Scales. PS – Join the conversation! I have been doing lots of “talking” today – now it’s your turn! If a Student were to ask you why the Harmonic Chromatic Scale with a center bar line looks different than the Harmonic Chromatic Scale without a center bar line, what would you say? Take a look at these instructions, Sacha. We just did these and talked about it last week. Shelagh, that was an easy question, I think. How about “The bar line cancels all accidentals. So, when you use a bar line, you have to repeat the accidentals. If you don’t use a bar line, then the last accidental used on the same note ascending is still good for the note that is in the descending part of the scale.” Does that work? This is so clearly presented I can’t thank you enough. What wonderful eyes you have! Thank you! The blog has now been updated with the correct graphic! !